I just love living in a semi-rural area. Within a half mile of us, there are horses, cattle, goats, and sheep. And these beauties, who live just across the road for us. 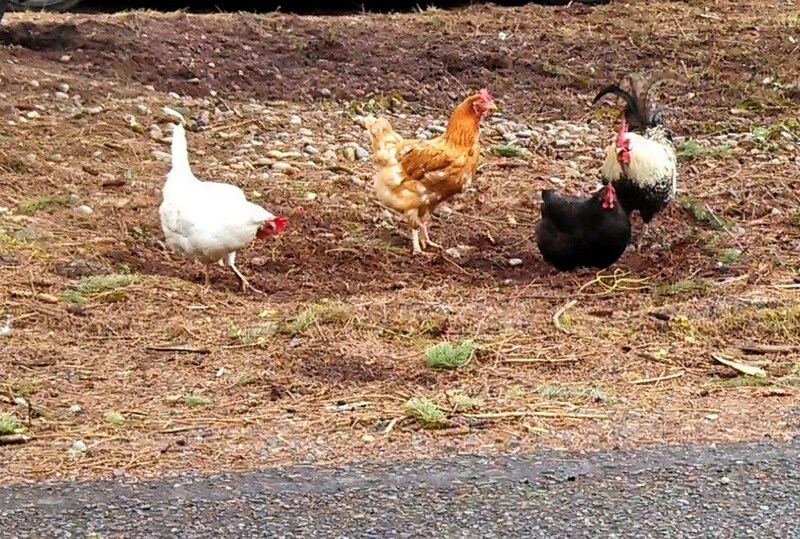 Here a moa käne (rooster) shows his girls where to find the tastiest stuff to eat. The other day when I left the house, one of the girls was out in the middle of the street. A car was coming toward them; we both stopped and I shooed the silly moa back where she belonged. The other driver and I waved to each other as we each went on our way. This rooster was keeping his girls where they belonged! This entry was posted in 365 Days, Farm Stuffs. Bookmark the permalink.